Wee mustang lad is not much taller than the greasewood. 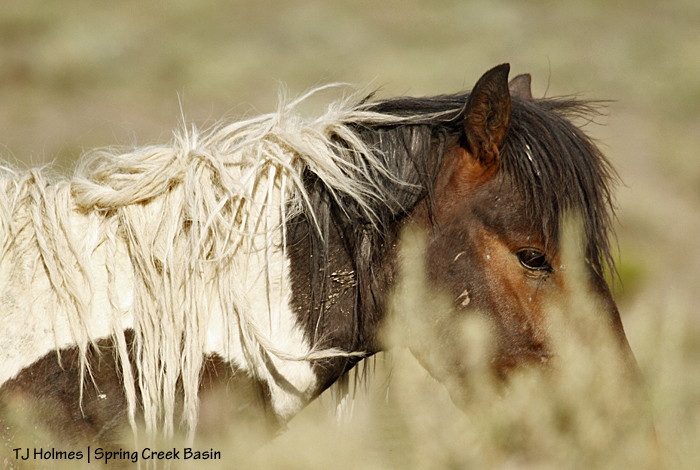 Our beloved and iconic wild stallion of Spring Creek Basin. His official name is Traveler; I called him Sir Grey long before I knew that name. He is loved by many, and rightly so. Feathery fineness. Swishing against breeze and bugs, a constant whispered conversation of contentment. After some beautiful weather … blazing blue skies, day after day. 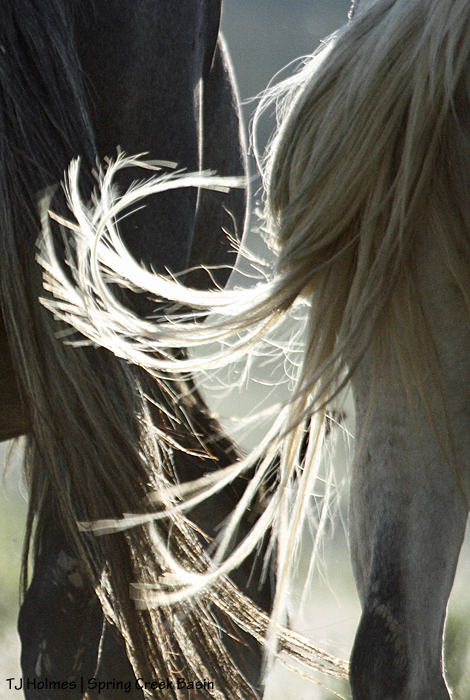 We’d love some cloud cover, even wispy mares’ tails. … can take away her beauty. Could she be any more stunning, washed and shined and brushed and combed? Doubtful. 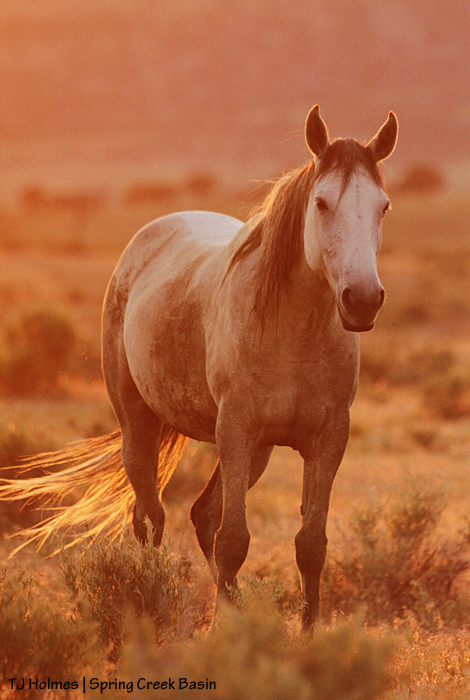 Attention locals: The Colorado chapter of the National Mustang Association plans to host a fundraiser from 5:30 to 8:30 p.m. Friday, July 10, with the film “Roaming Wild” at the center of the event. 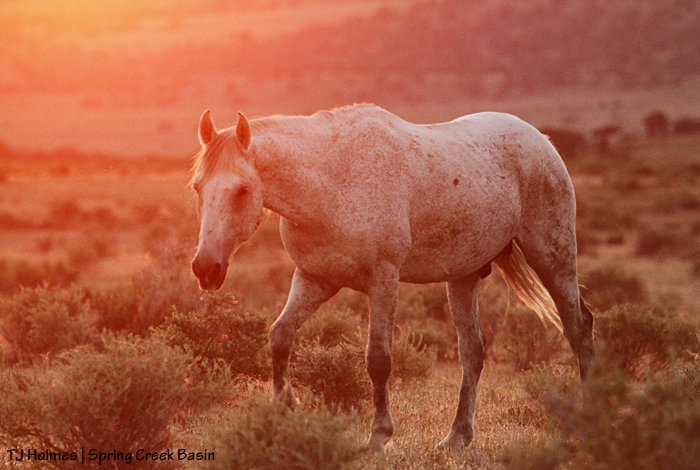 Funds raised from ticket sales and the silent auction will benefit Spring Creek Basin mustangs and other wild horses in Southwest Colorado (potentially those in Mesa Verde National Park). Find more information and buy tickets on NMA/CO’s website. Among other things, this film addresses the benefits of fertility-control vaccine PZP, which has been used in Spring Creek Basin for four years. 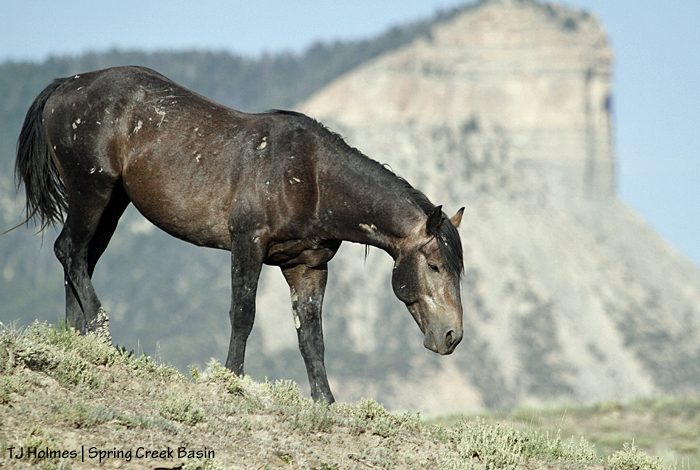 By slowing the population growth of the herd, at least one roundup has been prevented, a trend we hope to continue. Sunflower Theatre in Cortez will provide the venue. Doors will open at 5:30 p.m. for the silent auction, with appetizers and a cash bar available. The film will start at 6:30 p.m. 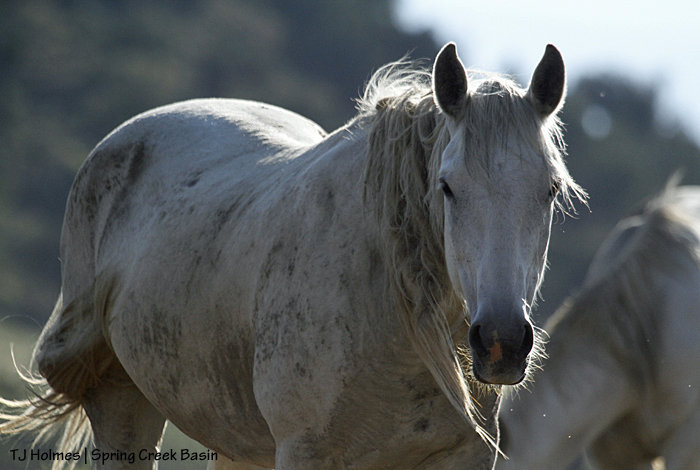 Afterward, NMA/CO board members will be available for a question-and-answer session about issues challenging wild horses and burros, their advocates and managers. We hope to see “old” friends and meet new ones interested in our mustangs! Piedra, oh so pretty in the pink glow of almost-sunset on the longest day of the year. Sometimes, it’s hard to be grateful *enough* for the incredible beauty of this world. To share that gratitude with those for whom you are supremely grateful is one of the simplest and most wonderful joys of this life. On this first day of summer, much love to all the dads out there! For your guidance and support, thank you. My dad and mom recently visited, along with an uncle and cousin, and as always, we had a wonderful time. I am blessed with an awesome family! Happy Father’s Day to all the dads in my family. You set a superb example for all of us! Happy Father’s Day to dads everywhere, two-legged and four-!